I was given an eArc copy by the author, and I’ll do my best to give an honest and fair review. This first book The Arete Series has a fascinating premise that deviates from the typical “children of the gods” motif. The Arete are descendants of beings cursed by the gods such as Medusa, but it’s more of a Cursed With Awesome situation. El, the main character is a drakon, so she has fire powers, and she also has a controlling gaze. The main action of the story begins when El inadvertently causes one of the patrons at the art house she works in to jump off a bridge. The man survives, but using her powers has the risk of alerting the dreaded Order her grandmother Helene has been hiding her from her entire life. With the catalyst for the story in place, El’s estranged mother Anna returns to take her to a safe house in London. Helene, herself, is a powerful Arete, but she put out her eyes, thereby nullifying her powers, so that she could hide from the Order. El is told next to nothing by either her mother or the friends Anna leaves her with. The seventeen year old is given an injection to hide her from the Order, because certain Arete blood will do that. Eventually, though, she gets frustrated with all the secrets and concealment and winds up running after a handsome Arete guy who it was spying on her for the Order. At this point, it become unclear who the real bad guys are: the Order or the rebels, and El is more confused and angry at the information being withheld from her, as she decides to go along with the handsome Arete to see for herself. The Order wants El to compete in Elysium where Arete vie against each other, though I’m not entirely sure of the reason. It has a Hunger Games vibe to it, though there’s less at stake. After a series of events El is trained for the arena by Dan, one of Anna’s rebel friends, learning to control her fire powers, and this is what reminded me of Mistborn, though again, there was far less at stake. I know this is YA, but it really bugs me how they always have to have a romantic arc in them, usually a love triangle ( I also know this is probably due to editor/publisher demands for the genre).. The relationship between El and *spoiler* Dan *end spoiler* seemed far to abrupt. He goes from almost hating her to her having feelings and then him sneaking in to give her a kiss after one of her matches. It seemed wildly irresponsible for someone trying to topple a dictatorship, though there is an explanation given afterwards. Later, there’s another Arete man who’s a possible love interest, and this just seems like the common YA love triangle trope. It was difficult to keep all of the different types of Arete straight, since many if not all of them had two types of power. As fore mentioned, El as a drakon could control fire, but she could also manipulate people with her gaze. I wasn’t sure if this was a drakon ability or an Arete one. Earth manipulators would make those they stared at feel heavy, and typhons (airy Arete) would make them feel light. Then there were the graeae who were the Triad or head of the order. It was graeae blood that was used to mask El’s power from the Order, and empousa (another type of vampire-like Arete) blood could heal nearly any wound. I’m not entirely sure about the details of many of these, because there was a lot of information. A glossary would’ve been useful, though there was one in The Mistborn Series, and I still had major issues with that. Glossaries are good for reference, but the different types should be differentiated enough in the text to stand out. It’s hard to keep track of that many, and their names are appropriate and indicative of their function, but when you have more than one type of power, it gets a bit complicated.. The main antagonist is utterly reprehensible. You don’t love to hate her; you just hate her and seriously want El to burn that smug, assured look off her face. She’s utterly in control and has El right where she wants her through the entirety of the novel, but at the end, she becomes sympathetic, and this creates that common confusion of having a villain you want to and still could hate, but also feel sorry for in understanding their actions/motivations. This was excellently done on Ms. Else’s part in conjunction with making another character culpable. 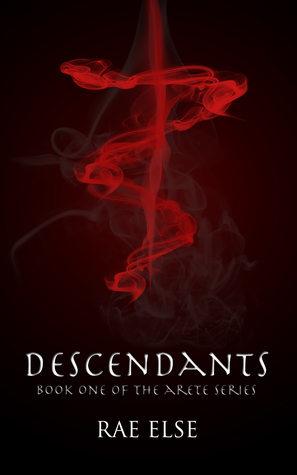 Descendants was a fair introduction to a new YA trilogy. It has an interesting premise and deviation from a cliched trope, but it still sticks with some that it could have shaken up like the love triangle, and often devastating events could’ve had more of an impact in showing rather than telling. Excellent review! I went on a YA novel binge a few years ago and I think I’m still recovering from it, but this seems like a decent one (even if I don’t pick it up right away – it’s not you it’s me haha). And the main antagonist sounds like a hoot – I love a well-written villain! I agree with your assessment of the obligatory love triangle in YA fiction… I suppose that’s high drama to a teenager (takes out cane and puts on reading spectacles), but they wouldn’t keep doing it if the books didn’t sell, right? YA and Urban Fantasy are actually my arguably least favorite genres! But they’re ubiquitous and there are so many different types that I don’t really think I can say that anymore. Plus my favorite standalone is a YA (The Fault in Our Stars) and I’m reading one about British teens that could bump that one out of position, so really it’s not the genre, it’s more how the genre is normally written. Harry Potter and Hunger Games are two of my favorite series, too, so my proclamation becomes even weaker considering that. It’s a quick way to create high stakes, and it’s something teens can understand. Actually, I think there may be one in The Raven Cycle, which is another YA series, and it’s going to be my favorite series this year easily, but it was so well done, I hardly noticed it :O So I guess even a tried and true trope can surprise you. True. I read The Hunger Games, The Pretties series, and the first two Divergent books before I stopped. Eight YA books in a row and they all started to blur together (not really, but the teen drama got to me after a while haha). I really loved The Fault in Our Stars, and of course Harry Potter and Hunger Games are just well-written stories, so I agree it’s just how the information is presented! I would recommend the Pretties series, even though I wasn’t a huge fan of the main protagonist of the trilogy, although I think that was the point. I wouldn’t waste your time on reading it, to be honest especially if you weren’t that big on Insurgent. I think the author kind of copped out, took the lazy way, and I’m annoyed about it. I’ll add the first book to my TBR list! That love triangle trope is a killer when it comes to reading. it’s so common now in YA because it causes instant tension. Aw, that’s too bad to see it dodge one over-used trope, only to fall so quickly into another. I wanted to be fair, but honest since the author is someone I know through blogging. I really think it’s possible the love triangle is because that really appeals to the YA crowd. Yeah, I think you’re right. I can imagine a lot of people get pressured into throwing in that aspect of the love triangle since it seems to sell. I don’t mind a love triangle if it makes sense and is done well since, sometimes they happen in real life, but so many times it just feels like they’re in a book because it’s part of the YA formula at this point. Ha! I’ll have to look the 4th of July one up. I don’t think I’ve seen that one yet. I love his Beauty and the Beast one he did, too. 😛 He’s just hilarious. Awesome review! The whole fire controlling drakon thing sounds neat. However, I hate silly love triangles so I’m going to pass on this. My TBR list is already too big to conquer at my slow reading pace, haha. And since YA is filled with silly love triangles, it’s so hard to avoid it. I mean I *get* it. It’s common for the people these books are aimed at to be in that situation so they can related to it, but still.